From Chapter 7 of Managing in the Next Society by Peter Drucker. Buy and calendarize the book. I have added some formatting changes to make it easier to catch your attention and digest. I’ve also added some links. This interview was conducted by George Gendron, editor in chief of Inc. magazine, in the author’s office in Claremont, California. It was based on the author’s specifying the topics and the interviewer’s questions. The author himself edited the interviewer’s draft into the final text. The interview appeared in a special 1996 issue in Inc. magazine. Can Large Companies Foster Entrepreneurship? Do you agree that we in the United States are the best practitioners of entrepreneurship, that we’re way ahead of other countries? Absolutely not! It’s a delusion, and a dangerous one. We may have the largest number of new business starts and new-business failures, but that’s all. We’re probably not even number two. Barely forty years ago, Korea had no industry at all. The Japanese, who had ruled Korea for decades, didn’t allow any. They also didn’t allow any higher education, so there were practically no educated people in Korea. By the end of the Korean War, South Korea had been destroyed. Today Korea is world-class in two dozen industries and the world’s leader in shipbuilding and other areas. If Korea is number one, and we’re not number two, who is? Not too far behind Korea is Taiwan, which like Korea was preindustrial in 1950. Today Taiwan is a world leader in a number of high-tech areas, including microchips. And don’t forget the Chinese, who are starting new business after new business on both sides of the Pacific. Okay, so third is still respectable, no? The U.S. record is no better than Japan’s or Germany’s. Japan has a larger proportion of world-class companies that either didn’t exist forty years ago or were mom-and-pop shops: Sony, Honda, Yamaha, Kyocera, Matsushita, for example. Germany owes its rise from the ashes of World War II to its present position—the world’s third largest economy and number one in per capita exports of manufactured goods—to an explosion of entrepreneurship that turned hundreds of brand-new or obscure little shops into world class manufacturers and industry leaders. One example is Bertelsmann, one of the world’s largest multimedia companies, which is active in forty countries. In 1946, when Reinhard Mohn, the great-grandson of the founder, returned from a prisoner-of-war camp, Bertelsmann was a small-town publisher of religious tracts. You said a moment ago that America’s entrepreneurial “delusion” is dangerous. How so? What bothers me more than the fact that the common belief in our entrepreneurial superiority simply isn’t true is that it’s lulling us into a dangerous complacency—not unlike our complacency about management in the early 1970s. Then we were convinced that American management reigned supreme, just as the Japanese were about to run circles around us in mass production and customer service. I’m afraid our complacency about our entrepreneurship and innovation is going to have us outflanked again, not only by the Japanese but also by the Koreans. In this country we by and large still believe that entrepreneurship is having a great idea and that innovation is largely R&D, which is technical. Of course we know that entrepreneurship is a discipline, a fairly rigorous one, and that innovation is an economic not a technical term, and entrepreneurship creates a new business. In fact, it’s what made Edison so successful more than a century ago. But American businesses with few exceptions—Merck, Intel, and Citibank come to mind—still seem to think that innovation is a “flash of genius,” not a systematic, organized, rigorous discipline. The Japanese are organizing innovation. They’ve set up small groups of their brightest people to systematically apply the discipline of innovation to identify and develop new business. Is there any one key to that discipline? Innovation requires us to systematically identify changes that have already occurred in the business—in demographics, in values, in technology or science—and then to look at them as opportunities. It also requires something that is most difficult for existing companies to do: to abandon rather than defend yesterday. So many new businesses start out with high promise. They do extremely well the first year or two and then suddenly are up to their ears in trouble. If they survive at all, they are forever stunted. Are there typical mistakes entrepreneurs make but could avoid? There are actually four points—I call them entrepreneurial pitfalls—where the new and growing business typically gets into trouble. All four are foreseeable and avoidable. The first comes when the entrepreneur has to face the fact that the new product or service is not successful where he or she thought it would be but is successful in a totally different market. Many businesses disappear because the founder-entrepreneur insists that he or she knows better than the market. So, often the entrepreneur is actually succeeding but doesn’t realize it? No, it’s worse than that. He or she rejects success. There are thousands of them, but one of the best is over one hundred years old. A man by the name of John Wesley Hyatt had invented the roller bearing. He made up his mind that it was just right for the axles of railroad freight cars. Railroads traditionally stuffed the wheels of their cars with rags soaked in oil to handle the friction. The railroads, however, were not ready for radical change; they liked their rags. And Mr. Hyatt went bankrupt trying to persuade them otherwise. When Alfred Sloan, the man who later built GM, graduated from MIT at the head of his class in the mid-1890s, he asked his father to buy him Hyatt’s small bankrupt business. Unlike Hyatt, Sloan was willing to broaden his vision of the product. It turned out that the roller bearing was ideal for the automobile, which was just coming to market. In two years Sloan had a flourishing business; for twenty years Henry Ford was his biggest customer. Good story, but is the rejection of success really all that common? I’d say that the majority of successful new inventions or products don’t succeed in the market for which they were originally designed. I’ve seen it again and again. Novocaine was invented in 1905 by German chemist Alfred Einhorn for use in major surgery, but it wasn’t suitable. Dentists immediately wanted the product, but the inventor actually tried to stop them from using it for the “mundane purpose” of drilling teeth. To the end of his days, Einhorn traveled all over the world preaching the merits of novocaine as a general anesthetic. More recently, I know of a company whose founder created a software program that he was absolutely sure was what every hospital needed to operate smoothly. Well, the hospitals told him they weren’t organized the way he assumed. He didn’t make a single sale to a hospital. By pure accident, though, a small city stumbled over the program and found it was just what it needed. Orders began to come in from medium-size cities around the country. And he refused to fill them. Why do entrepreneurs reject unexpected success? Because it’s not what they had planned. Entrepreneurs believe that they are in control. That leads to pitfall number two. Entrepreneurs believe that profit is what matters most in a new enterprise. Growing bodies need to be fed, and a business that grows fast devours cash. You have to make constant investments just to keep even. This is totally predictable, so is totally unnecessary. I have saved more new enterprises than I can remember by simply telling the founder who showed me how beautifully things were going that now is the time to provide for your next financing. If you have six months’ to a year’s time to provide for your next financing, you can be reasonably sure you’ll get it and at favorable terms. Why do you think entrepreneurs have such a hard time grasping the concept of cash flow? They’re not the only ones. Warren Buffet once said that if he wants to find out how a company is doing, he doesn’t listen to security analysts. They talk profit, which is irrelevant. He listens to bank credit analysts; they talk cash flow. I have yet to see one of the stock market newsletters I get talk about liquidity and the financial position of a growing company. They talk about profit margins and profitability. Is it a product of our business schools? Fundamentally, businesspeople are financially illiterate. Well, let’s say the business pays attention to cash flow, gets beyond the cash crunch, and grows rapidly beyond expectations. What’s the third pitfall looming on the horizon? When the business grows, the person who founded it is incredibly busy. Rapid growth puts an enormous strain on a business. You outgrow your production facilities. You outgrow your management capabilities. The entrepreneur begins running around like the proverbial one-armed paperhanger. He sees the sales figures, and he sees profit forecasts. Those make him believe that in another year he can sell out and get $10 million. And he doesn’t see that he’s outgrowing his management base. You know, I’ve worked with entrepreneurs for fifty years and can say that there is a fairly normal curve; 80 percent fall within it. Even if your business is growing at a normal rate—not tripling in size every six months, but growing at a good, solid, sustainable rate—the management crunch hits you at the end of the fourth year. That’s when you outgrow your management base? Starting out, the typical founder does everything himself. He has helpers, but he doesn’t have colleagues. Then suddenly everything goes wrong. The quality falls out of bed. But every young business makes mistakes, lots of them. What’s the one symptom an entrepreneur cannot afford to ignore when it comes to outgrowing management? I always ask people who come to me how they respond to opportunity. To avoid a crisis, you should sit down and create a management team. By that time you have maybe forty people working for you. Look them over to see who shows management ability. You call in those four or five people (you’re not likely to have more), and you say, “I want each of you to sit down alone next weekend and look at the other people here, including me. And then you all sit down together, take a fresh sheet of paper, and list the key activities of the business. Young entrepreneurs can’t pay to bring in a management team. But here’s Tom, and Tom is good at customer service, so you might also let him run the office. Give him an extra load for a few months or a few years, or give him an assistant. But Tom’s job now is customer service. And here’s Jane, your manufacturing person, who’s better than anybody else at handling people. So your manufacturing person also becomes your people person. People decisions; and Calendarize what? And you start to meet once a month, maybe on a Saturday, and within a year you have a management team. It takes at least a year, more likely eighteen months, to create a team. To really begin to work together as a team? Yes, but also to know that even though Joe’s a difficult person to work with, he’s exactly the financial person we need. Or to know that Tom is developing into a first-rate sales and marketing manager but is a weak customer service manager. Tom may have been the best you had, but he ain’t good enough. That’s a hard decision for an entrepreneur to make, especially if Tom was there at the start. Yes, but if you start to build your team eighteen months ahead of time, Tom’s going to know that it’s time to step aside. You can’t wait until everything falls out of bed at the same time. The fourth pitfall is the most difficult one. It’s when the business is a success, and the entrepreneur begins to put himself before the business. Here is a person who’s worked eighteen hours a day for fourteen years and has a $60-million business and a management team that works. Now he asks himself, “What do I want to do? Those are the wrong questions. If you start out with them, you invariably end up killing yourself and the business. What should you be asking? You have to start with what the business needs. That’s where an outsider can be very helpful. Over the years I’ve had maybe one hundred people come to me in that situation. And when I ask them why they’ve come to me, most say that their wife says that they’re not doing a good job anymore, that they’re destroying themselves, their family, and the business. Occasionally you have a bright daughter who says it. If the son says it, he’s brushed aside by the founder, who’s thinking, does he want to take over and push me out? But a wife or a bright daughter can say that. Sometimes an outside shareholder speaks up, or an accountant or a lawyer. Usually somebody has to kick that entrepreneur hard to get him to face up to the harsh reality that he doesn’t enjoy this anymore. He knows he’s not concentrating on the right things. Do you think entrepreneurs today are smarter about avoiding the pitfalls you’ve been describing? No? With all the education, with all the MBAs? No. Education gives you neither experience nor wisdom. Back in the 1980s we heard a lot about “intrapreneurship,” but it all seemed very faddish. Now that the hype has died down, can large companies really foster entrepreneurship? Quite a few do it. And many midsize companies are even better at it. But it’s different from what most books mean by the term entrepreneurship. Most books take their cue from the last great entrepreneurial period in Western history before ours—the sixty years before World War I. All our major institutions, not just our business institutions, were created and shaped in that period. The period began with the Great Exhibition, in London, in 1851, which ushered in the Second Industrial Revolution. The 1850s saw William Henry Perkin, in England, invent the first aniline dye and with it the modern chemical industry. That was the decade that saw Werner von Siemens, in Germany, invent the first electric motor and with it the modern electrical industry. That was the decade that saw the triumph of Cyrus McCormick’s reaper and with it the invention of mechanized agriculture. That was the decade that brought the first transatlantic cable and the first regular transatlantic steamship service. That was the decade in which Bessemer, in England, invented the steelmaking process, and the brothers Pereire, in France, founded the Crédit Mobilier and with it modern finance. From that point until 1914, we had a major new invention every fourteen months or so, each immediately creating a new industry. How was that period of innovation different from today’s? All those new industries moved into a vacuum. There were no large corporations when the railroad in this country became one. And there was no competition. The railroad didn’t displace anybody, didn’t cause any dislocation. But now the world is full of organizations. And we’re in turmoil because so many of the organizations whose roots go back one hundred years or more are not going to survive. What does that mean for entrepreneurship in large companies? The large organization has to learn to innovate, or it won’t survive. For some companies that means reinventing themselves. Increasingly, large companies are growing through alliances and joint ventures. Yet very few of the big boys know how to manage an alliance. They’re used to giving orders, not to working with a partner, and it’s totally different. In an alliance or a joint venture, you have to begin by asking, “What do our partners want? Those aren’t easy questions for somebody who grew up at GE or Citibank and is now at the top or near the top of a huge worldwide enterprise. But innovation also means changing your products and services to keep up with markets that are changing faster than anybody has ever seen. Look at what’s happening with banks. There are only a few large banks today in this country that make a profit out of doing the things banks traditionally do—commercial loans or deposits, for example. Banks are making profits out of credit cards, ATM fees, currency trades, and mutual fund sales. To stay in business, the large organization has to innovate. But can large companies foster entrepreneurship? They have to, to compensate for the difficulty they usually have learning how to work in a partnership or alliance. They set up a unit internally that behaves quite differently from the rest of the company. The more successful the unit, the more difficult it is to make sure that the large company doesn’t put the same expectations on it as it does for the rest of the company. When it’s a new venture, whether it’s outside or inside the business, it’s a child. And you don’t put a forty-pound pack on a six-year-old’s back when you take her hiking. What are some examples of companies that have been successful at internal entrepreneurship? There are companies that are good at improving what they’re already doing; the Japanese call this kaizen. There are companies that are good at extending what they’re doing. And finally there are companies that are good at innovation. Every large company has to be able to do all three—improve, extend, and innovate—simultaneously. I don’t know of any large companies that can do that yet. Also see : Council on Competitiveness Urges National Innovation Ecosystem to Lead Next Wave of U.S. Economic Growth. How much of Peter Drucker’s work have these people absorbed? Could you step back and summarize your views about social entrepreneurship? First, it’s as important as economic entrepreneurship. In the United States, we have a very healthy economy but a very sick society. So perhaps social entrepreneurship is what we need the most—in health care, education, city government, and so on. Fortunately there are enough successes around so that we know it can be done—and also how to do it. You have to start small—the big cure-alls never work. That was the problem with President Clinton’s health care reform plan. Now we are experimenting in health care all over the lot, and the outline of a new American health care system is slowly emerging out of literally hundreds of local experiments. We still talk about big, ambitious, nationwide educational cure-alls, yet in a lot of places local schools—public, parochial, and private—are having successes based on local entrepreneurs. And we know that the American public—especially the young, educated, double-earner family—is ready to support social entrepreneurship, especially as volunteers. You’ve said that more and more community jobs are being handled by local institutions, for profits and nonprofits. Why are so many small nonprofits, to use your phrase, “grotesquely mismanaged”? Because they wrongly believe that good intentions move mountains. 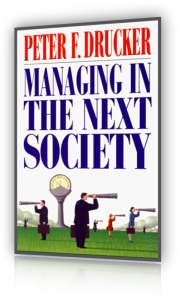 I helped start a foundation for nonprofit management in 1990. We have in our files more than one thousand stories of small and mostly local institutions that do a job that nobody else can do. We gave our annual innovation award this year to the Rainforest Alliance, which has found a way to save the rain forest while increasing both the crop and the income of the banana farmers, once the greatest enemy of the rain forest. Even the runners-up for the award are social innovators. These are social entrepreneurs, not business entrepreneurs. The social entrepreneur changes the performance capacity of society. Clearly the need is there, or we wouldn’t have founded eight hundred thousand nonprofits over the past thirty years. Yesterday charity meant writing out a check. Today more and more people who are reasonably successful don’t feel that’s enough. They are looking for a parallel career, not a second career. Very few of them change jobs. You’ve said that you think we’re on the verge of a period of enormous innovation. We’ve also got enormous numbers of people in the private sector who want to be involved in social entrepreneurship. Are you arguing that we’re now going to see more social innovation than we’ve seen in a long time? But so many people in business are leery of nonprofits because they see them as nonprofessional. And they’re both right and wrong. They’re right because far too many nonprofits are either poorly managed or not managed at all. But they’re wrong because nonprofits are not businesses and should be run differently. They need more not less management, precisely because they don’t have a financial bottom line. Both their mission and their “product” have to be clearly defined and continually assessed. And most have to learn how to attract and hold volunteers whose satisfaction is measured in responsibility and accomplishment, not wages. What about innovation and entrepreneurship in government? That’s probably our most important challenge. Look, no government in any major developed country really works anymore. The United States, the United Kingdom, Germany, France, Japan—none has a government the citizens respect or trust. In every country there’s a cry for leadership. But it’s the wrong cry. When you have a malfunction across the spectrum, you don’t have a people problem, you have a systems problem. What we have now is roughly four hundred years old. The invention of the nation-state and of modern government in the closing years of the sixteenth century was certainly one of the most successful innovations ever. Within two hundred years they conquered the globe. But it’s time for new thinking. The same holds true for the economic theories that have dominated the past sixty years or so. Government—not businesses or nonprofits is—going to be the most important area of entrepreneurship and innovation over the next twenty-five years. Innovation and Entrepreneurship book outline with an exploration of Systematic Entrepreneurship.